Ordinance first introduced with members of the Chicago City Council Progressive Caucus with affected workers in 2017. Chicago workers deserve predictability and stability. Unfair and unpredictable scheduling practices cause tens of thousands of Chicago workers to struggle to meet their responsibilities at home and on the job, harming their ability to make ends meet and the overall strength of our economy. When Chicago workers don’t know when they’re scheduled to work, or for how many hours, it’s difficult to manage basic expenses, arrange child care, continue their education, get a second job or pursue job training. San Francisco, Seattle and New York City are just a few of the places where comprehensive fair workweek laws have passed. In California, Connecticut, Massachusetts, New Hampshire, New Jersey, New York, Oregon, Rhode Island and the District of Columbia, employers are required to provide “reporting pay,” or to pay employees who report to work as scheduled but are sent home before completing their full shifts. The Chicago Fair Workweek Ordinance could impact some 40 percent of Chicago’s workforce. 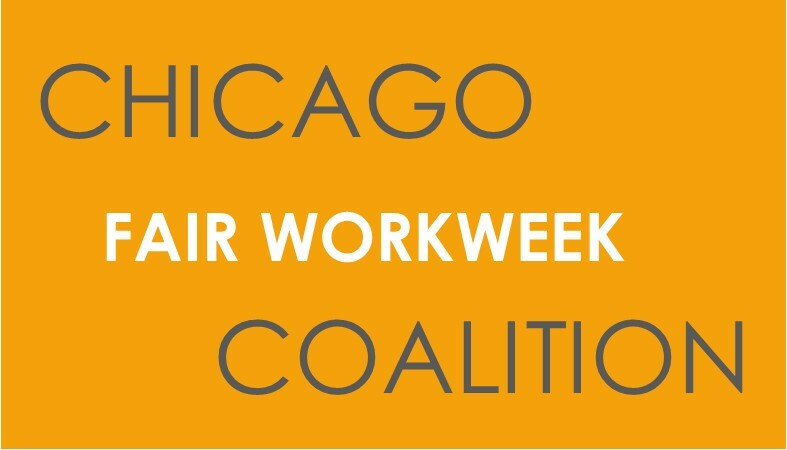 The Chicago Fair Workweek Ordinance, introduced in June 2017, will provide Chicago workers with the predictability and financial stability they need, and will create more stable, productive workplaces. The Fair Workweek Ordinance would apply to Chicago’s hourly workers. Workers covered by collective bargaining agreements may agree to waive this right. The bill would guarantee workers the right to request more flexible or predictable work arrangements and, in some cases, to receive a more customized schedule. Workers will also have the right to refuse shifts that are scheduled with 11 hours or less between them. Offer Chicago workers predictability and stability. guarantee that work will be available. Workers are also often scheduled for multiple, non-consecutive shifts and are hired and retained without clear expectations about their schedules or number of work hours. The ordinance will also guarantee workers at least two weeks advance notice of their schedules. Require employers to first offer existing employees additional hours prior to hiring additional workers. This will help in combating underemployment and under-scheduling of Chicago workers. Require employers to provide clear expectations about hours and schedule on an ongoing basis. Employers would have to provide new schedules and expected work hours to employees at least 14 days in advance of a change. would have to provide one additional hour of pay for each changed shift, except when changes are due to unforeseen causes beyond the control of the employer.